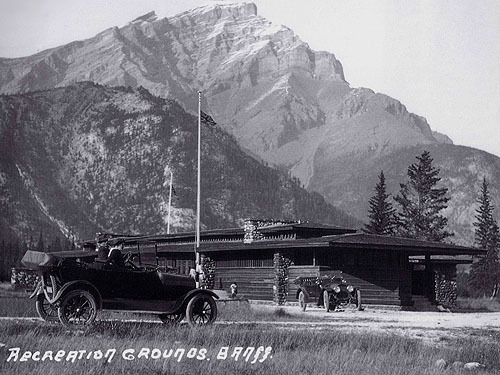 Historic photographs of the Banff National Park Pavilion. 1: Looking toward the Southeast, circa 1913. Two of Mt. Rundles' peaks are visible in the background. The roof is cantilevered approximately 14 feet at the corner. The end of the pavilion is rotated 90 degrees, coming to a point. Two of the fireplaces and the clerestory windows are visible, as well as the broad stairs that lead up to the open terrace that runs half the length of the building. The Ladies Retiring Room and Kitchen are on the left, the interior Pavilion is on the right. The drive does not appear on the survey. 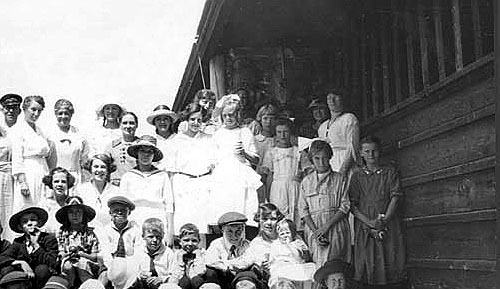 1b: Detail looking toward the Southeast, circa 1913. The roof is cantilevered around 14 feet at the corner. The end of the pavilion is rotated 90 degrees, coming to a point. The fireplace and the clerestory windows are visible, as well as the broad stairs that lead up to the open terrace that runs half the length of the building. The Ladies Retiring Room and Kitchen are on the left, the interior Pavilion is on the right. The drive does not appear on the survey. 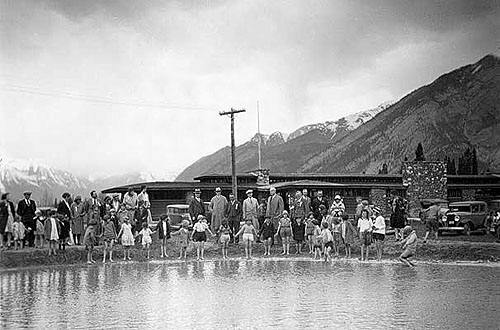 Courtesy of the Public Archives of Canada. 2b: Detail looking toward the Northeast. There were strong horizontal lines, three prominent fireplaces, clerestory windows and terrace. The Ladies Retiring Room and Kitchen are on the left, Men's Retiring Room and caretaker's room on the right. 3b: Detail looking toward the Northeast, circa 1920. 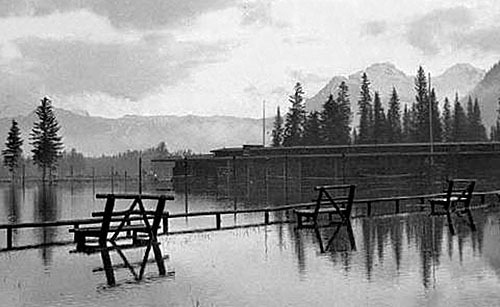 This flood, as well as the severe flooding in 1933 caused irreparable damage to the Pavilion, leading to its eventual destruction. 4b: Detail ooking toward the North, circa 1925. The basic material was wood, stone and glass. The siding was horizontal board and batten. There were strong horizontal lines, the low-pitched roof, broad overhanging eaves, horizontal rows of art-glass windows and doors, three prominent fireplaces, clerestory windows, balconies and terrace. 4c: Detail. The siding was board and batten. The lines created added to the horizontal feel. There were broad overhanging eaves, horizontal rows of art-glass windows and doors, clerestory windows, balconies and terrace. The elongated row of vertical slats above the horizontal board and batten, form Balustrated windows, or as Wright specified in the River Forest Tennis Club, 4"x4" Vertical Spindles with glass between. This allowed natural light in, while providing a measure of privacy. This design was repeated on either side of the Men's and Women's Retiring Rooms, as-well-as either side of the Fireplace in the Nook. 4d: Detail. The balcony, visible on the far left, is accessed from the Men's Retiring Room and Caretaker's Room. The end of the pavilion is rotated 90 degrees, forming a point. The stairway leading to the Men's Retiring Room can be seen on the far right. 4e: Detail. The end of the pavilion is rotated 90 degrees, forming a point. The stairway leading to the Men's Retiring Room can be seen in the center. The roof is cantilevered approximately 14 feet to the corner. On the far right the covered entryway can bee seen just under the cantilevered roof. 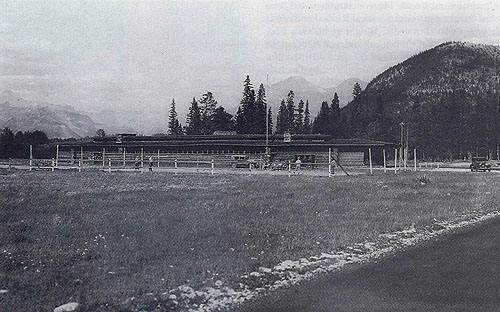 5: Looking toward the North, circa 1920. Stoney Squaw Mountain is in the foreground on the left, Cascade Mountain is in the background. The stairs on the right lead to an open Terrace which ran half the length of the building. Doors, which opened outward, lead to an expansive interior "Pavilion". The women seated on and in front of the Terrace wall add a perspective to the immense size of the Pavilion. The "Flag Poles" appear in the original drawings, just as they were constructed, but were designed with a decorative cap. 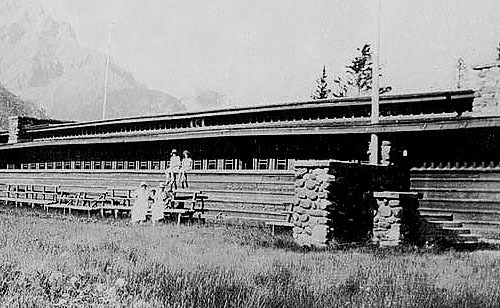 Wright designed a much more elaborate "Pole" in the Lake Geneva Hotel (1911). 5: Detail. The stairs on the right lead to an open Terrace which ran half the length of the building. Doors, which opened outward, lead to an expansive interior "Pavilion". The women seated on and in front of the Terrace wall add a perspective to the immense size of the Pavilion. The "Flag Poles" appear in the original drawings, just as they were constructed, but were designed with a decorative cap. 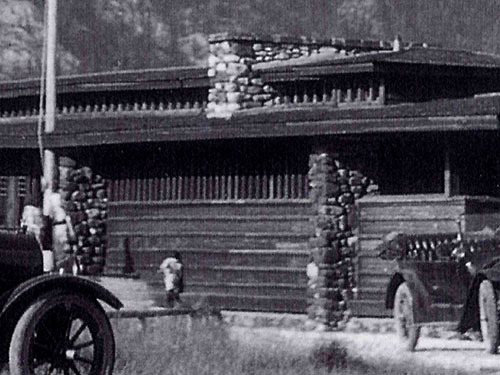 Wright designed a much more elaborate "Pole" in the Lake Geneva Hotel (1911). 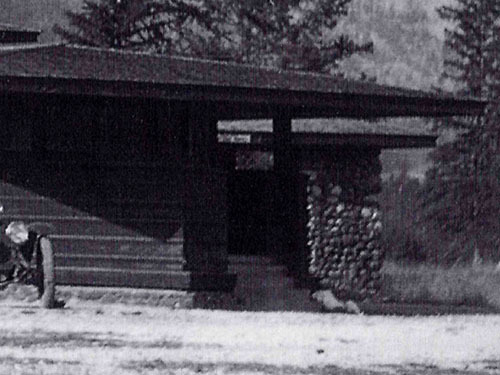 6: The basic materials were wood, with horizontal board and batten siding, stone and glass. These stairs lead to an open Terrace which ran half the length of the building. Doors, opened outward, leading to an expansive interior "Pavilion". This grouping adds a perspective to the immense size of the Pavilion. 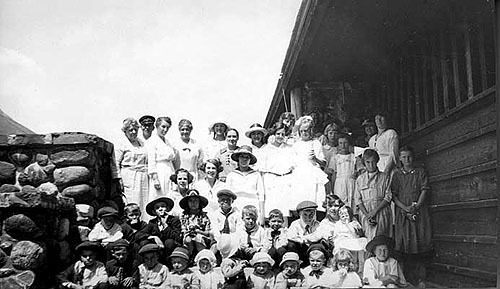 The "Flag Pole" appeared in the original drawings, just as they were constructed, and can be seen behind the group. 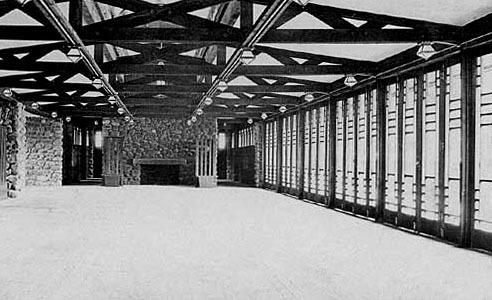 The elongated row of vertical slats above the horizontal board and batten to the right, form Balustrated windows, or as Wright specified in the River Forest Tennis Club, 4"x4" Vertical Spindles with glass between. This allowed natural light in, while providing a measure of privacy. 6b: This detail allows for a closer look at the board and batten siding, as well as the Balustrated windows. These stairs lead to an open Terrace which ran half the length of the building. 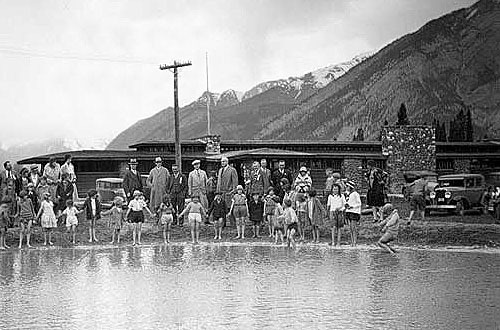 7: Looking toward the North, circa 1930. Mount Cory and Edith are in the center background. 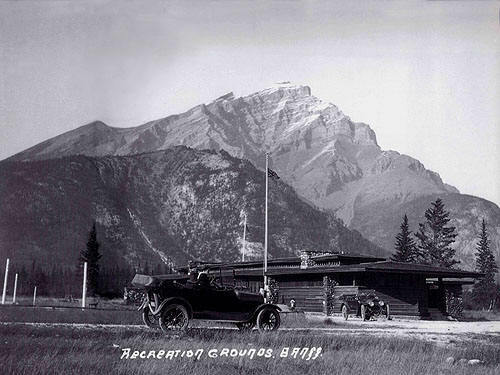 Mount Norquay is in the foreground on the right. 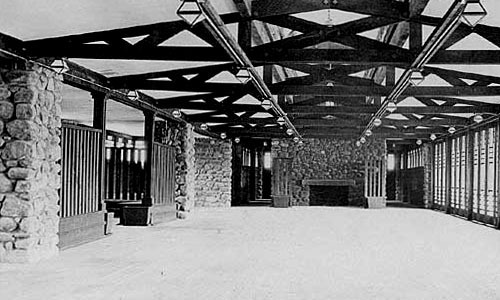 The porte cochere (Carriage Entryway) and center Fireplace are visible. 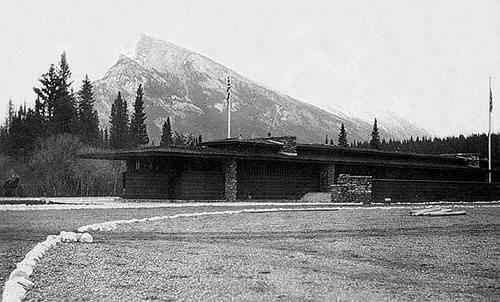 There were strong horizontal lines, low-pitched roof, broad overhanging eaves and clerestory windows. The Men's Retiring Room and a room for the caretaker were on the left. 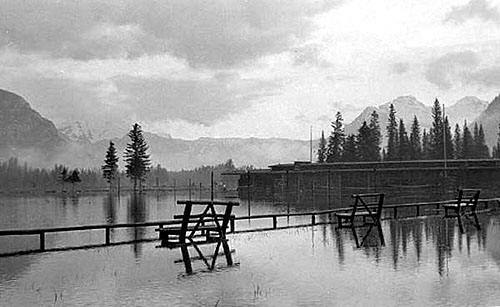 The pond in the foreground, just off the Southeast corner of the Pavilion, no longer exists. Could it have been dug as a winter ice skating rink? 7b: Detail. 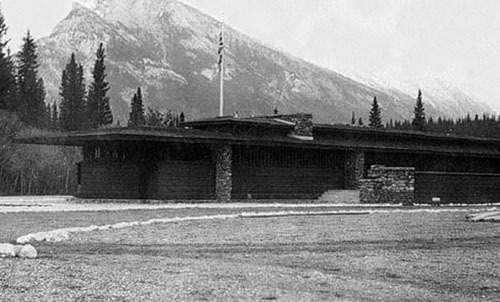 The porte cochere (Carriage Entryway) and center Fireplace are visible. The Men's Retiring Room and a room for the caretaker were on the left. 8: Interior. Eye candy. A sight for sore eyes in the wilderness. There were many dramatic elements on the interior of the Pavilion. Exposed trusses. Stone piers and fireplaces. Art glass doors. Although not indicated in the original drawings, Wright enclosed the fireplace alcove on the left with 4" x 4" vertical spindles adding a measurer of intimacy, much like his tall back chairs surrounding some of his dining room tables. They were also added to either side of the fireplace in the center. The exposed trusses were designed to add clerestory windows, which ran the length of the building. The light fixtures were customized. 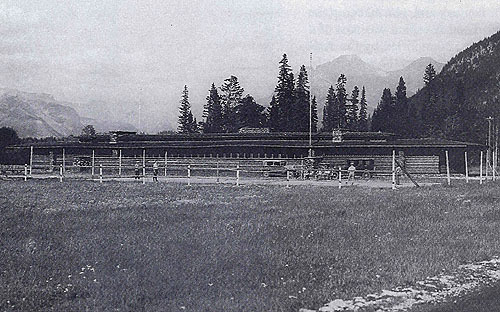 One distinctive design element Wright used in the Tennis Club and repeated here may have been unique to these two buildings. 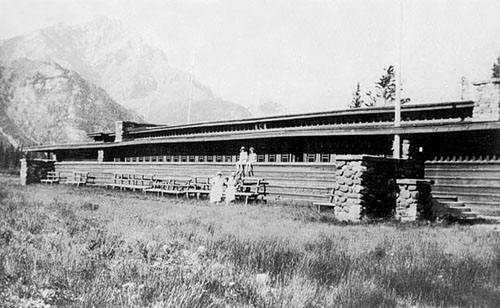 On either side of the Men's and Women's Locker rooms was a elongated row of Balustrated windows, or as Wright specified in the Tennis Club, 4"x4" Vertical Spindles with glass between. This allowed natural light in, while providing a measure of privacy. This design was repeated here in the Pavilion, on either side of the Men's and Women's Retiring Rooms. They are visible just past the fireplace on the left and right side. The art glass doors opened outward from the expansive interior, in essence, removing the wall which lead to an open Terrace which ran half the length of the building. 8b: Detail. 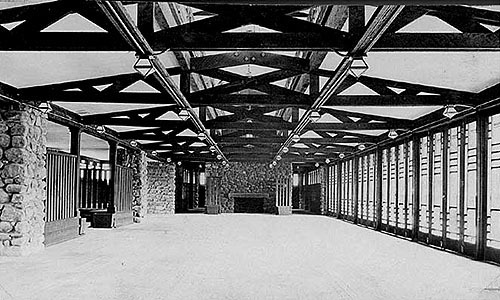 Wright enclosed the fireplace alcove on the left with 4" x 4" vertical spindles adding a measurer of intimacy, much like his tall back chairs surrounding some of his dining room tables. They were also added to either side of the fireplace at the far end. 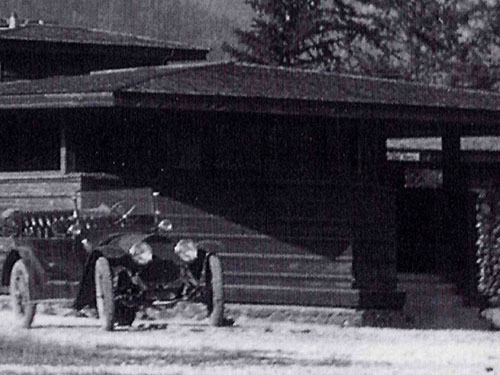 The exposed trusses were designed to add clerestory windows, which ran the length of the building. The light fixtures were customized. On either side of the Men's and Women's Retiring Rooms was an elongated row of Balustrated windows which allowed natural light in, while providing a measure of privacy. They are visible just past the fireplace on the left and right side. 8C: Detail. Art glass doors opened outward from the expansive interior, in essence, removing the wall which lead to an open Terrace which ran half the length of the building.